I bought a couple of quilt magazines this weekend, and I thought I would add magazine and book reviews to my offerings here. I used to buy a LOT of books and magazines, but this past year I've been trying to cut back, because I already have plenty of project ideas and the last thing I really need is more! But there is something very pleasant about sitting back and looking at a lot of nice colour pictures, so I still cave once in a while. You will find that most of my reviews are positive, because I try not to buy anything unless I'm pretty sure I'll like it. But if I do buy a dog I will tell you! As a rule I usually like magazines from Better Homes and Gardens - I think it is because all their products lean towards a warmer palette, which is my strong preference as well. This magazine is $16 here in Canada, but for me it was well worth it. It is 128 pages and there are no ads and no articles, it is almost all quilts. There are not even any totes or bags, just quilts ranging from simple minis to table toppers to throws and bed quilts. And one small fused greeting card project. As the title suggests, they all assume you have a pretty big stash! Even better, they are all easy projects suitable for confident beginners, but with enough design value to be appealing to more advanced quilters. The rotary cutting and quick-piecing instructions are good. They are almost all pieced quilts, with very little applique. The only slight quibble I would have is that there is not a lot of advice on choosing fabrics. The advice is usually confined to "sort scraps into lights, mediums and darks." I know that many quilters lack confidence in choosing fabric, so this could be an area for improvement. The up side is that with a scrap quilt a little bit of imperfection adds to the charm. There were three projects that gave me ideas for the future. 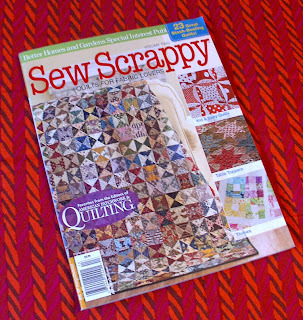 The hourglass quilt on the cover is quite striking, and I probably have enough scraps to do it right now. It uses a more "country" palette with brown undertones, and I have a lot of older fabrics in these colours. I find myself preferring clearer colours in the new fabrics I buy, so this could be a good way to use up that older fabric. The fun thing about this quilt is that there are a couple of surprises in it - can you see the nine patch block in the cover photo? I also like the quilt in the bottom right hand corner of the cover. It is made of nine patch blocks with white centres and sashing. White makes a quilt look very modern and fresh to me. It is not just white in the borders, there is also a lot of white in the fabric prints that tie it all together. It was fun to see some of the same fabrics in this quilt that I used in my yoyos! There is also a low-contrast snowball block quilt in the magazine that got me thinking about a project that's been in the back of my mind for a while now. I've seen snowball blocks all over lately and liked them, but never seriously thought about making any. But this time it clicked. My mother collects chicken-themed things, so I've been collecting chicken-themed fabrics for a couple of years now with the intention of making a throw quilt. You need a block with a simple design to show off all those fabrics, and a snowball block would be ideal! I can make the corners in solid black and white to unify the quilt and give it some graphic punch. Perfect! The chicken fabrics are in the unwashed part of my stash, and it was all I could do to not immediately throw them all in the washing machine. But I was observing my first day of rest, and laundry didn't seem to fit with that, so I am still waiting. Anyway, you already know that I have plenty on the go! Finally, another quilt I really liked in the magazine but am unlikely to make, now anyway, was a design by Valori Wells, whose designs are always very fresh. It is all machine-appliqued concentric circles, done in bright, solid colours. I think this is the big new trend in quilting, solid fabrics, and we will start seeing more of them. Gosh, I have gone on at length here! I will review the second magazine, Quiltmania #85, tomorrow.